The Fish Ecology Collaborative Research Unit (FECRU) aims to foster rigorous science in freshwater fish ecology in Australia, and more specifically the Murray-Darling Basin. It is establishing partnerships with government natural resource agencies interested in the management, conservation or restoration of fish populations and the ecosystems they occupy and other research centres such as the Murray Darling Freshwater Research Centre. 1) Provide a hub for research collaboration that combines fundamental science with applied conservation, environmental and fisheries management. 2) Educate post-graduate (Honours, MSc. and PhD) students and support post-doctoral research and training. 3) Influence public awareness, management and conservation of fish populations and aquatic ecosystems through the dissemination of science. The mission of the FECRU is to carry out rigorous and independent science, underpinned by ecological concepts, to help address the most challenging problems related to the management and conservation of fish and aquatic ecosystems. Research undertaken by the unit will be expected to improve our knowledge of the ecosystem role of fish, so that management, conservation and restoration strategies are based on rigorous scientific evidence, with a view to long-term sustainability. The unit will establish co-funded collaborative research projects between government natural resource management agencies and researchers at CSU. Projects will be developed and undertaken by post-graduate and post-doctoral researchers in collaboration with academic staff at CSU and a state or Commonwealth government partner. By virtue of CSU's inland geography and research track-record, many projects will focus on freshwater systems in the Murray-Darling Basin. However, research that will generate broadly applicable and fundamental new insights, regardless of geographic area, will receive priority. Dr Paul Humphries 30 years fish ecology experience. Post-doctoral research fellow 12 years fish ecology experience. Post-doctoral research fellow 13 years fish ecology experience. Senior Scientist, Murray-Darling Freshwater Research Centre. Ecology of riverine animals; ecological modelling; physiological ecology. Experimental dispersal of nase in the River Danube, Austria. (On-going) Humphries, P., Keckeis, H, University of Vienna, Habersack, University of Natural Resources and Life Sciences, Vienna. Kingsford, R.T., Mac Nally, R. King, A.J., Walker, K.F., Bino, G., Thompson, R., Wassens, S. & Humphries, P. (2015) A commentary on 'Long-term ecological trends of flow-dependent ecosystems in a major regulated river basin', by Matthew J. Colloff, Peter Caley, Neil Saintilan, Carmel A. Pollino and Neville D. Crossman. Marine and Freshwater Research, 66:9708-980. Humphries, P., Kumar, S. and Lake, P.S. (2015). Engineered artificial flooding: more questions than answers. Frontiers in Ecology and the Environment, 13: 242-243. Kopf, R.K., Finlayson, C.M, Humphries, P., Hladyz, S. Sims, N. (2015) Anthropocene baselines: assessing change and managing biodiversity in human-dominated aquatic ecosystems. BioScience 8: 798-811. Kopf, S., Humphries, P. and Watts, R (2014). Ontogeny of critical and prolonged swimming performance for the larvae of six species of Australian freshwater fish. Journal of Fish Biology. 84: 1820-1841. Lechner, A., Keckeis, H., Schludermann, E., Humphries, P., McCasker, N. and Tritthart, M. (2014). Hydraulic forces impact larval fish drift in the free flowing section of a large European river. Ecohydrology 7: 648-658. Whiterod, N., Meredith, S. and Humphries, P. Refining the activity component of a fish bioenergetics model to account for swimming costs. 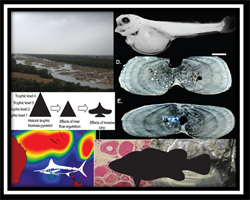 Marine and Freshwater Behaviour and Physiology, DOI: 10.1080/10236244.2013.819155. Winemiller, K.O., Humphries, P. and Pusey, B. (2016) Protecting apex predators. In:Conservation of Freshwater Fishes ( Closs, G., Krkosek,M. and Olden, J. Eds), Cambridge University Press. Humphries, P. and Walker, K. (2013). The Ecology of Australian Freshwatere Fishes: An Introduction. In: Humphries, P. and Walker, K. (eds.) The Ecology of Australian Freshwater Fishes. CSIRO Publishing, Melbourne. pp. 1-23. King, A.K., Humphries, P. and McCasker, N.G. (2013). Reproduction and Early Life History. In: Humphries, P. and Walker, K. (eds.) The Ecology of Australian Freshwater Fishes. CSIRO Publishing, Melbourne. pp. 159-192. Humphries, P. and Walker, K. (2013). ; Looking Ahead. In: Humphries, P. and Walker, K. (eds.) The Ecology of Australian Freshwater Fishes. CSIRO Publishing, Melbourne. pp. 317-325. Supervised by Dr Paul Humphries, Dr Nicole McCasker and Dr Michael Reid (UNE) The reconstruction of palaeo-environments of river floodplain wetlands. Continuing his long-term association with the University of Vienna, Paul was one of the organisers of the 39th Annual Larval Fish Conference held at the university in July 2015, where the paper Humphries, P., Kopf, S., Kaminskas,T., Keckeis,H., McCasker,N., Stoffels, R., Bond,N. & Watts,R. Integrating life history theory and dispersal in riverine fishes, was presented. While in Austria, Paul also ran a Masters Field Course and class. This project, which got off the ground with a CSU media release in February last year, certainly generated a lot of media interest including a segment on the ABC's 7.30 Report on April 4.It took off with a Bang and now there almost 200 members in our facebook group, 122 locations of stuffed Murray cods and close to 150 fish, mostly in pubs and sporting clubs around the Murray-Darling Basin. are aquatic resource managers, educators or students interested in aquatic environments, people from organisations involved in environmental protection, and aquatic researchers keen to stay abreast of developments outside their specialist areas. It contains articles, using non-specialist language as much as possible, that summarises the background and significance of recently published research findings with special attention to novel ideas, new interpretations, and interdisciplinary connections involving the freshwater environment.